If you haven't seen the first segment of "Real Scary Stories" on Fox Family Channel, you don't know what you are missing. It is about time some one put together a real life show that gave people the opportunity to share their paranormal experiences. While I wish a show like this would be based on all age experiences, Fox has decided to limited this series to the 13 and 19 age level. If you didn't see the first episode, it was great. It held my interest and the editing was perfect for this. Going in and out of interviews, scenes, and building up the suspense. I think they have put together the right formula to make a very successful show. I wish them the best. If you didn't already know on September 17, I ventured out to Bachelors Grove Cemetery to be apart of this new Fox program "Real Scary Stories." 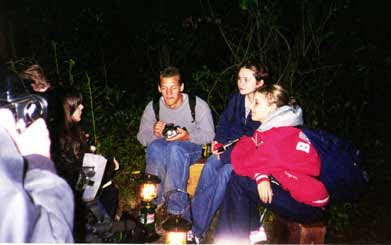 They were shooting a segment about the legends of Bachelors Grove and I had been asked to contribute by discussing the legends and show three teenagers, who were selected for this segment to investigate it, around the cemetery. Two other friends of mine were also selected to give their side of what goes on at Bachelors Grove; Monty Tobin of Haunted Chicago and Mike Komen of The Ghost Hunters society. Together with our knowledge, we helped piece together for the viewers what this incredible place is all about. Not to take away from the show, but the segment I originally was apart (Bachelors Grove) was edited out. To be honest I am getting fed up with all the Hollywood BS that goes on. They get whatever they can from you and then leave you high and dry. I could have put better time into something else if you ask me. I drove out there on a Sunday, for two hours, waited around from 4pm til 11:30pm. I was peeved when I watched it and saw not one shot of me talking about the grove. I gave them a lot of evidence and people to use and fortunately Monty got on showing his great photos, but they hacked the heck out of what really goes on at the Grove. They didn't talk about the great history to it, barely any of the legends, no reenactment, instead they left the poor kids out there by themselves. And the flower thing!!??? There aren't any legends I am aware of about a darn flower being left on Tombstone. Hmm, I wonder who put it there....Trust me, it wasn't a ghost. What could have been a great segment about Bachelors Grove was poorly done. Having documented some great ghost voices and being witness to a some exciting paranormal experiences in my life, I was more then aware of how active this place is when it comes to the supernatural. You can really feel the energy when you walk towards it. They didn't even get into that. It became more of a Blair Witch plot reaction then anything else. You might ask, did anything happen? that we'll never see?? As usual, I taped whatever I could with my tape player to see if I would pick up any ghost voices. While I was only in the cemetery during daylight (most activity has occurred for me during dead night) I did get to venture in for 5 minutes to pick up some equipment before I left. The most interesting voices I got were actually not in the actual cemetery but half way down the path in between the cemetery and the highway. Here is two things that I got on tape. While talking to one of the film crew I was explaining to him how I have captured a lot of ghost voices here. He was amazed and said, "really, that's incredible." I said , "yeah, they'll just appear while we're talking." Right after this a voice appears on the tape with a distinct breathing sound of, "Whuh, whuh". I then said right after " you'll know it's not our voices." It was amazing how this appeared during my explanation to him that the really neat thing about capturing EVP's (Electronic Voice Phenomena) is that the voices will sometimes appear the same time you and others are talking. This is significant because, you will hear everyone else's voices, and when you hear the voice from nowhere you realize that there was no possible way it could have been anyone else in the room. The voice don't match up! Earlier on the recording there was a scream "Yaahhhhhhh!" that appeared out of nowhere! I have no idea what it was, but it definitely wasn't anyone there. 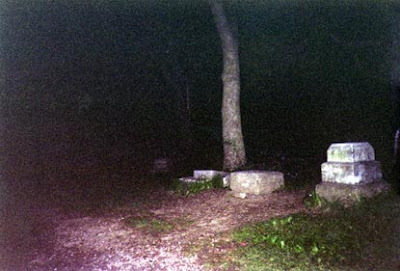 Probably the neatest thing I saw was when the three kids walked back from the Cemetery (around 10:30pm), they had left them alone in the Cemetery allowing them to investigate on their own. They were carrying a lantern and the illumination of it was the most eeriest thing I had seen at this place before. At first it freaked me out. From a distance I wondered, "what is that??!!" It actually sparked the camera crew to run over and film it asap! 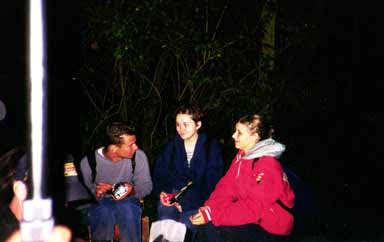 The three kids came out and sat down talking to the crew and camera about what they had witnessed. While I was not able to hear everything, the power generator was so loud it was hard to even think, I noticed how one of the girls was so upset she was crying and her makeup was flowing down her face. She was definitely spooked. It seemed as though she had seen and felt something unlike anything she had experienced before. I felt really bad and wanted to talk to her. Hey I know what it's like to be scared. One of the kids Mark, was believed to have been seen by her at a certain spot of the Cemetery, when in actuality he was in a completely different location. The figure she saw resembled him but seemed to have a glow around it or behind it. It will be interesting to see what she really says and what there responses are, as well as what really happened. Probably the only thing that made me mad about this whole ordeal is, having been around paranormal activity all my life I would consider my self a professional on what we are dealing with. How to protect one's self, how to be aware of it around you, what it wants, and so on. As well as giving strong advice. Upon playback of my tape one of the walkie talkies captured the kids calling back to the crew from the cemetery that they were seeing something and feeling really spooked. NOTE: It is known that some people who enter Bachelors Grove can sometimes go through complete emotional changes. This is believed to be brought about by the spirits attaching themselves to the individual or making their presence known. You end up experiencing the emotions of the entity. Wether it be sadness for being dead and not moving to the next plain, or being lonely. It really messes with your emotions, because they are not yours, they're some else's. I believe this is what the one girl was experiencing. I listened as she asked, "Where is the guide?" In the beginning of the shoot I acted like a guide walking them around the cemetery answering questions for their investigation of the place. I told them about the different things that could happen and the legends that surround it. After that shoot I was taken out of the picture. My job was done. The boy, Mark, responds, "I don't know and says "Chris are you there?" It was obvious things were going on and they wanted to know what. But, I was not allowed to talk to them. I was not allowed to talk to them after they entered the cemetery nor afterwards because of some damn law that states an adult cannot counsel a minor unless you are a practicing legal psychologist or minister and have a license. I fully understand Highland entertainments force of this issue, which I had to/and gladly abided to. But, as an editor and publisher I have the right to express my opinions at the state that enforces this. For this is my webitorial, isn't it! Like anyone with a license is going to know what to say to a kid that has seen a ghost or experienced their emotions? Give me a break. I can understand to some degree the states enforcement of this but we are dealing with something here that is gained by experience, not by a degree! Unfortunately, I was not able to answer any questions nor offer any counsel to these three kids, Because I don't have a license. (I knew I should have taken 2 more credits in college to get my major in Psychology!!! I only ended up with a minor.) No matter, I am currently applying for a ministers license. I believe my experiences in my childhood happened for a reason, and it wasn't to sit on the sidelines. I often have people call me with bad ghosts in their homes or their children who talk to angels or ghosts that visit them in the families house. Parent don't know how to deal with this, so they come to me because I was that kid they are raising now. I know what they are all going through. Back to that night of the shoot. I watched as the panel asked question to the three kids, and while I wished I was apart of it, to add any help or understanding to what those kids were going through, would have been great and eventful. But, that wasn't the case and I have to watch the show like anyone else to learn the outcome. As it neared 11pm, I had to say my good byes and thanks and drive home. It was fun and tiring. The best part of the show was the second half about three kids who visit a vortex and man did they get some great stuff on tape! I plan on posting thee audio clips of voices I got in the Phenomenal Audio section soon. Once I get the software and time to upload them.